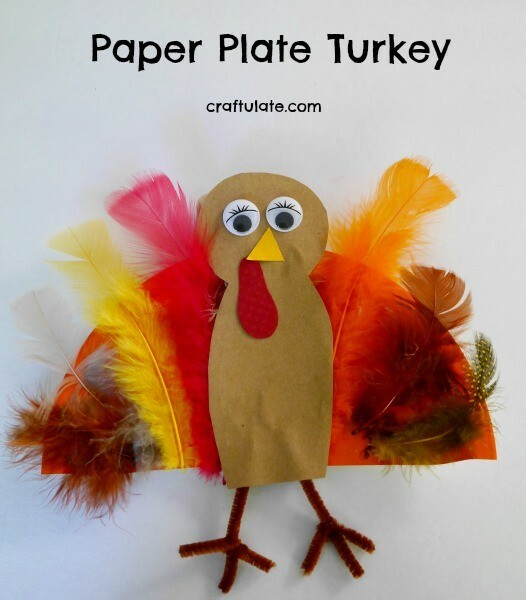 This paper plate turkey craft is a fun activity to do for Thanksgiving! 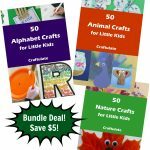 So far in the Craftulate household we haven’t done many Thanksgiving themed crafts or activities. But as I spend more years in the US and my son grows up – I find that neither of us want to miss out! 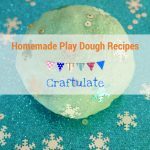 To prepare the craft, cut the paper plates in half and gather the other materials. 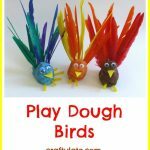 Start by inviting your child to glue on the feathers. I had prepared my version in advance – it helps my son understand the final result we are aiming for but if he wants to do his own version then I don’t stop him! Cut the brown card (or felt) into a head and body shape, the yellow card into a beak shape and the red card into a wattle shape. Then have a little giggle to yourself over the word “wattle”. I cut these out in advance for my son, but older children could try cutting out the pieces for themselves. 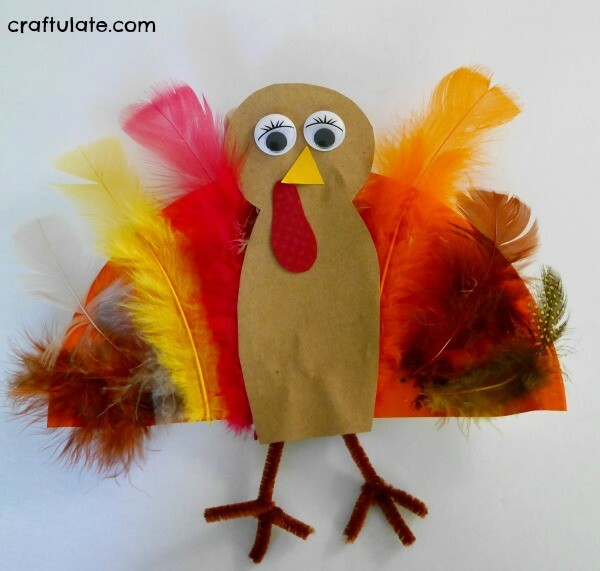 Invite your child to glue on the beak, wattle and the googly eyes onto the bird. Shape the pipe cleaners into legs using the wire cutters (this is a job for an adult) then tape them onto the back of the turkey’s body. Hehehe turned out super cute! !